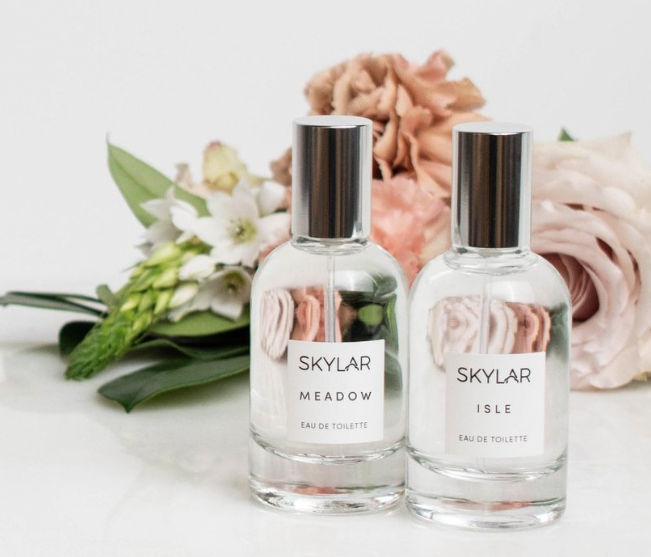 Skylar is a brand of natural perfumes that you can feel great about spritzing. The name Skylar was inspired by the qualities of a clear day – airy, natural, and beautiful. But perfume, in an Outdoor Store? To that we say, yes! Clean modern scents that are unique, light, and never overpowering. Natural ingredients, free of paragons and toxic chemicals. Cruelty-free. Vegan and never tested on animals. These are commitments that are in line with what we support here at Shepherd & Schaller, with our selection of organic fabric garments, recycled and fair trade items and love of the environment. Fragrance is an awesome gift or treat to yourself, and the perfect complement to an active lifestyle. The cherry-on-top is the ability to layer Skylar scents. Begin by taking their quiz here to see which fragrance will suit you best. Skylar cares about your health AND the health of our environment and animal friends. They make ingredient and packaging choices that keep the Earth (and our friendly animals) in mind. Dual-purpose packaging, renewable resources, recyclable packing materials – Mother Earth is pleased.Additionally, they do all manufacturing here in the U.S. and are proud to partner with ethical and eco-friendly suppliers. Previous Previous post: When you care about the Outdoors, it’s part of your Indoors too. Luumi can help.